Monkey Island 2 is my 2nd favourite point and click game of all time. Only Toonstruck is higher on my list, and that's only because it no longer exists in any playable form. Monkey Island is the sequel to The Secret of Monkey Island. The special edition of that game was released last year. Again for the 2nd game the graphics have been totally redone, and the voice actors from 3, 4, and the Monkey Island Episodes have given the characters of the game voices for the first time ever. 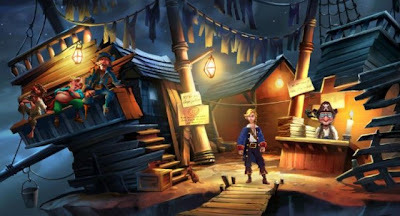 Monkey Island 2 takes place a few years after the events of Monkey Island. 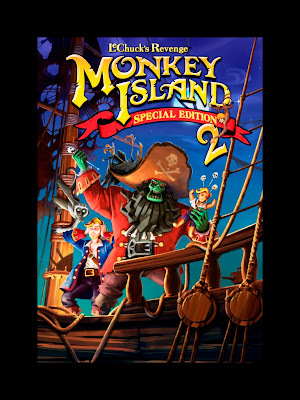 Guybrush Threepwood is in search of a legendary treasure called Big Whoop, and has travelled to lawless Scabb Island in his search. A series of strange circumstances leads to the resurrection of Le Chuck. He was a Ghost Pirate in Monkey Island, now he is a Zombie Pirate, and a angry one who wants nothing more than to kill Guybrush. To defeat him Guybrush must locate the treasure of Big Whoop. This game is so much better than Monkey Island. That game was fantastic, with a great script, but this one is even better. There are more Islands to explore, more characters, and more puzzles. The game is split up into 4 chapters, with the search for the map to Big Whoop in chapter 2 comprising the majority of the game. Point and click for those who don't know basically means (in the original at least) you control your character by clicking where you want him to go. There are commands at the bottom of the screen such as Pick Up, Push, Talk To etc with which you can interact with the objects, people, and locations of the game world. For the remake the commands are all hidden out of sight, brought into play via the shoulder buttons on the controller, and Guybrush can be moved around more easily via the D-Pad or left analogue stick. The locations again are all Pirate based, the game being set in the Caribbean. The initial 3 Islands you get access to are all different feeling places. You have Scabb Island with its Swamp, and Graveyard, Phatt Island which is a Dictatorship, and Booty Island which is permanently in party mode. The characters are all fantastic creations, made even better with the addition of voices for them. Many characters from the first game reappear, and there is many references to past events. Favourites of course would have to be Le Chuck, Guybrush, and Elaine Marley (all returning characters) but voices really made the characters of Stan (the used coffin salesman), Mad Marty (the tone deaf laundry worker), and Wally (the wimpy cartographer) come alive more than they had before. Not all the voices are like I would have liked. Largo Le Grande in particular I didn't really like the voice for. The problem with playing the game so much is that I can do it with my eyes shut, so the experience got a bit boring for me. That is only because I must have played the game from start to finish at least 30 times by now. The puzzles are clever, but there are some obscure ones hidden away in there. The graphical style again is not too smooth, though this comes with trying to match the animations of the new characters to the pixel-lated ones of the old game. 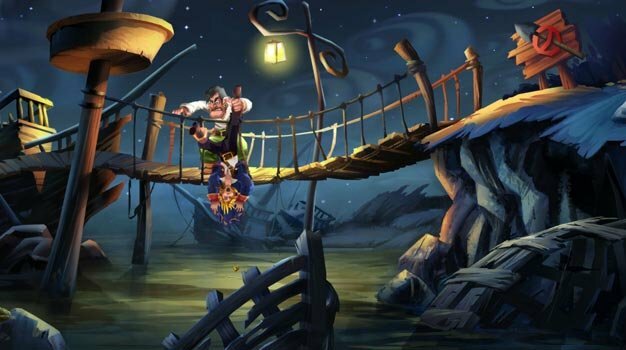 Differences from the original Monkey Island 2 then? As well as redone graphics, and voices the soundtrack has also been redone. The music in this game is one of the best soundtracks ever for a game, but I found myself missing the midi tones of the original. You can switch between the original game and the remake at the flick of a button, but it is a shame that you can't play the original game with voices enabled. Other changes include achievements (not very exciting though) and a commentary at key parts of the game. I could imagine that would be quite interesting to listen to, I shall do so one day. If you want to see what a great script in a game should be like, and be genuinely entertained by a very funny game then this is for you. 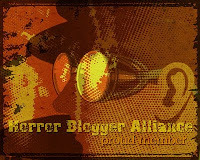 Plus it has a zombie in it!